How one quintessential New England home got a fresh update. Just 35 miles from bustling Boston and brimming with neighborhoods of quaint waterside cottages, the hook-shaped peninsula on the end of Massachusetts is the quintessential New England hotspot. Characterized by its harbors, windswept beaches, lighthouses, ponds and bay, Cape Cod is synonymous with northern beachside living. But for one family’s summertime getaway, the antique character of their waterside home, while charming, was in desperate need of a fresh update. 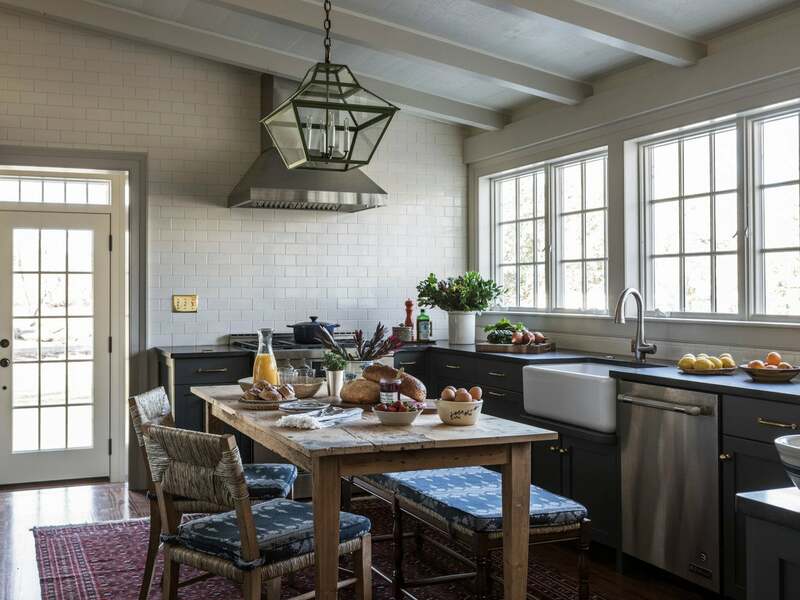 Seeking a home that captured Cape Cod’s waterfront lifestyle, the San-Francisco-based family enlisted Cali designer Caitlin Moran to transform their dark, drab kitchen into a space more suited to reside by the beach, all the while keeping its early 1900s charm. Setting out to capture the picturesque nature of the home and its surrounding town of Duxbury, Massachusetts, Moran worked with her clients to create a space that would cater to the easygoing nature of their family. With three kids and a love of entertaining at the forefront of the family’s needs, Moran did an overhaul of the kitchen and dining area. A wall of paned windows now looms above the kitchen sink giving way to a stunning view of the gorgeous water beyond. Translating that Atlantic blue into the light-filled space, Moran selected a saturated slate blue that grounds the space while black granite countertops maintain the vibe of the old home. Natural open shelving further opens up the space, while white subway tile to the ceiling makes it feel lighter and brighter than before. Although reconfiguring the space was no easy task, in the end, it was Moran’s favorite part of revamping the historical house. A lack of square footage inspired Moran to opt for a breakfast table instead of a traditional island, which adds an extra homey touch. In keeping the cozy, colonial aesthetic that Moran and the family were looking for, the dining area consists of custom pieces and vintage finds. A perfectly patina dining table was made from old wood wall boards and channel some of the house’s rich history with visible wear marks and remnant nail holes. Meanwhile, a custom upholstered banquette sits opposite traditional chairs as a casual dining option. A pro tip from Moran is to laminate the upholstery of our choice if you don’t want to commit to leather—it’s wipeable, will last, and in this case, the print adds some much-needed movement to the eat-in area. But in both spaces and throughout the home, Moran placed a major emphasis on preserving the integrity and history of the quintessential home. The solid, original floors span throughout while touches of vintage furnishings and finishes make the new reno feel like it belongs. The final result is a far cry from the cramped, dated space that once was. Now casual and comfortable, the updated home still gives nod to its original era with style and grace. Learn to love your inbox again by signing up for Domino’s daily email.